We provide online and interactive training resources to professional swim instructors, swim schools, and other learn-to-swim programs in the U.S. For over 40 years, generations of swim students have learned to swim using our teaching progression, and they’ve learned faster and more effectively than in other programs. We focus on the foundations of swimming first — trust, breath, and movement. 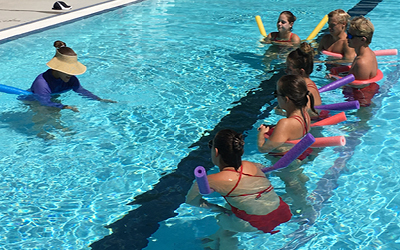 2, 4, or 6 hour practical, in-pool trainings aimed at challenging instructors with realistic scenarios to prepare them for whatever they might face in their lessons. These hands-on trainings are focused on building fundamental skills and techniques including breath, submersion, cueing, movement, building trust, class management, and techniques for teaching strokes. We also teach instructor effectiveness — how an instructor should look, sound, and feel to their students. Instructors will come away with greater confidence, a larger toolset, and greater preparedness. Great for low-resourced and seasonal programs that need a quick solution for staff training. We help your organization create training curriculum particular to the needs of your staff and your program. Training can be as specific or as broad in scope as you require. This training is designed to enhance, not replace, existing curriculum. Where applicable, we partner with a variety of experts to create this training. We build a unique curriculum to help your program meet your specific training goals. These programs can last anywhere from 2 hours to 3 days, and may cover aspects like creating curriculum, training-the-trainer, and confidently training staff. Ideal for swim teams/clubs, for established swim schools and aquatics programs, and for similar programs that have their own teaching curriculum or desired outcomes. You want to be a more effective swim instructor. You want access to new ideas for teaching foundational skills. You want to learn how to successfully submerge your students. You want to learn new techniques for working with babies, managing your class, and effectively teaching children with special needs. You manage a swim school and you need to augment your training resources. You supervise a staff of seasonal swim instructors and you want to enrich your in-service trainings. You want to gain confidence as a swim instructor or you want your staff of instructors to be more confident. You need a complete A-Z method for teaching a child to swim. You want to deeply impact families in a positive way. Designed for city aquatics programs in Northern California, this 2 hour or 4 hour training is conducted mostly in-water and trains on specific fundamental skills every swim instructor should know: techniques for teaching breath, submersion, and movement, building trust, managing a class, specific strategies for Special Needs students, and techniques for teaching strokes. 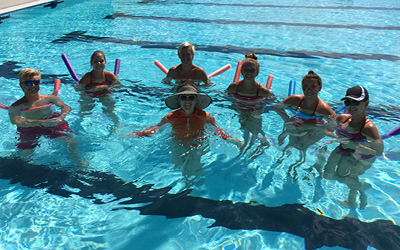 Intensive hands-on training for instructors on how to teach babies foundational skills for swimming, including bubbles, breath control, and movement. Instructors will learn how to comfortably handle babies in varying depths and how to use equipment (noodles, kick board, goggles, etc.) to engage and support baby in the water. We will demonstrate techniques for building trust, cueing, and baby’s first submersion. For less experienced yet motivated instructors who understand the skills they’re teaching, but need direction on teaching and managing their students effectively. Learn the multitude of techniques that confident swim instructors consistently apply. Includes focused training on voice, language, hands-on instruction, class management, breath techniques, submersion, and principles for cultivating trust. Designed for swim lesson programs wanting to empower their staff, and for private instructors looking to set themselves apart. Experienced and capable instructors will learn how to enhance their teaching practices with the Natina 10-step Teaching Progression and related principles. A graduate of this course will be prepared to teach any child how to swim. We give instructors step-by-step instruction for building confidence, endurance, and coordination in children ages 2-5 — with the end goal of producing children who love to swim and are good at it. We build swim instructor skills and confidence.